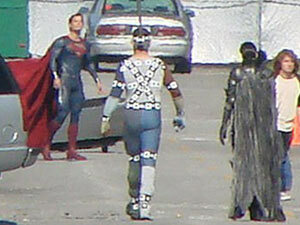 Superman will have a new costume in the new movie, Man of Steel. From this photo I stumbled upon on the Internet, noticeably absent is the iconic red briefs/trunks! In its place is one that is in a darker shade of blue. I wonder how fans will react to this. But searching for more photos, I saw this poster below. I am not sure if this is an official poster but again, take note of Superman's suit. It has scales! Hmmm... Is this reboot up to something? Will they make the Man of Steel a half brother of Aquaman? I won't be surprised since its director, Zack Snyder came up with what could be the strangest movie this year, Sucker Punch. In what could be another step away from tradition, Daily Planet Editor-in-Chief Perry White becomes a black man! 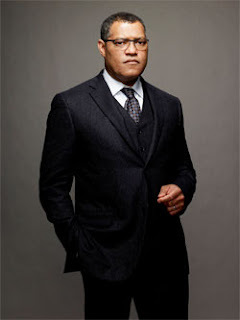 Indeed, the cigar chomping boss of Clark Kent and Lois Lane will be played by Laurence Fishburne. He becomes the first African-American actor to play the iconic role. I want to see how all of this will look like. 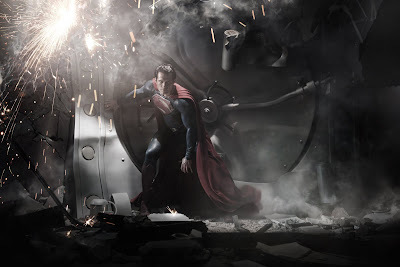 Man of Steel arrives in theaters in June 2013.
why cant they just give me superman as superman! nuff of the changes, puh-leaase!!! At least he still has his red cape and boots on.